The dogs loved dispersed camping because it meant they could run free. And it wouldn’t take long before Darby would inevitably chase Shadow. 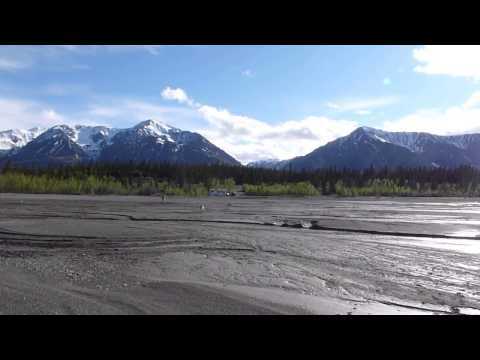 This video shows our RV parked along the edge of beautiful Kluane Lake in Yukon, Canada. The lake’s water level was surprisingly low for early summer, and our RV was a quarter-mile from the water’s edge. When we returned by Kluane Lake in August, all of this sand–where we are standing and the dogs are running–was under water. Kluane Lake is the largest lake in the Yukon, covering nearly 154 square miles or 100,000 acres. We spent a lot of time walking along the lakeshore and hiking the Kluane Mountains that you see rising behind the RV in the video.